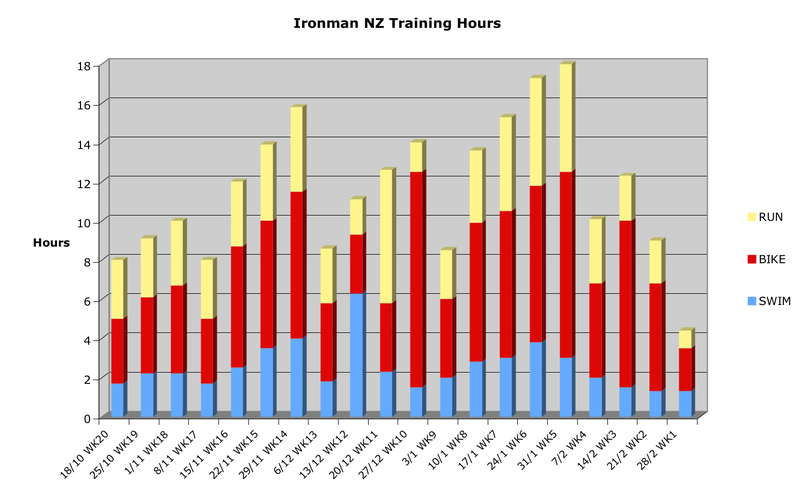 Here’s a look at the training hours required for the vanilla version of my 20 week Ironman training plan. The first week is 8 hours – that is pretty much as easy as it gets. It builds up to a maximum of 18 hours, with an average of almost 12 hours per week. Hours-wise, the breakdown is 50% biking, 30% running and 20% swimming. A reasonable mix. My problem is that my bike fitness has dropped way below my run fitness, and I need my bike fitness to be double my run fitness! How does the Vanilla Plan affect my Bike Fitness? You can see the gap between run and bike is increasing. It’s more obvious if we look at the fitness proportionally (the 2nd chart). My stated aim is get my bike to 55%, my run 33% and my swim 12%. If I stick to the vanilla four week training block then my bike percentage actually drops from 33% to about 30%. Not good! I would like to increase my bike fitness (CTL) by around 4 points per week. This as known as the CTL ramp rate. Common wisdom is that the maximum sustainable ramp rate is 4-8 TSS/wk. To achieve this ramp rate, I need to produce about 300 TSS points per week. To put that in perspective, my typical 40km/90 min ride between Burleigh and the Spit is worth about 70 TSS points, so I’d need to do that four times per week (approximately six hours of riding). I need to tweak the Vanilla plan. In the short-term I have to increase the amount of biking I’m doing and, if necessary, replace one of the runs (and/or one of the swims) with a bike ride. The Sunday long ride is the easiest one to increase because I can just start earlier. In these first four weeks I’ll try to make the Sunday ride a minimum of 3 hours and build up to 4 hours+. I’ve already changed this Sunday’s ride from 90 mins easy (about 60 TSS points) to a ride up Springbrook – twice (about 3 hours and 200 TSS points). Springbrook is where I usually do my FTP (Functional Threshold Power) test. It’s a 25 min climb, so twice up it will also give me a better idea of my FTP than once up it would. I’ll repeat this test during every recovery week and use it as benchmark for my fitness. Additionally, I might change the Thursday morning ride to be a set of hill repeats. Much better! My bike fitness will almost equal my run fitness!, and proportionally climbs to about 42%. Well on the way to my 55% target. In the long-term I’d love to throw in a couple of big bike weeks to really kick the bike fitness up. Anyone up for a weekend or mid-week training camp? Spousal bribes will be required! This entry was posted in ctl, ironman, training plan, tss and tagged bike, ctl, ironman, predicting ctl, training targets, tss. Bookmark the permalink.